What you should see after searching the App store for “saahe”. Once you’ve downloaded the app and opened it, you will find yourself in the “Store”, which is simply the list of available content. You will need to be online in order for the content items to display when looking at the Store. Selecting an item shows a description of the document and enables you to download it (see below). Once documents have been downloaded, they appear in your Library. Once content has been downloaded to the library it will be available when you’re offline. Note that not all content is currently available. For example, the abstract book is undergoing final preparations and will be added as soon as possible. It will appear in the Store as soon as it is ready to be published. When you know exactly what (or who) you’re looking for, remember that each document is searchable, which means a lot of saved time when it comes to finding the presentation (or topic) you need. Searching for “reflection” in the programme. Clicking on results will take you to that page. We should emphasise that, while the app can be installed and used on mobile phones, the user experience is poor because of the small font size. This is particularly noticeable when viewing the programme. We therefore recommend that you install the app on a tablet instead. Alternatively, you can also view the available content through your desktop or laptop browser, at http://saahe.snapplify.com/. 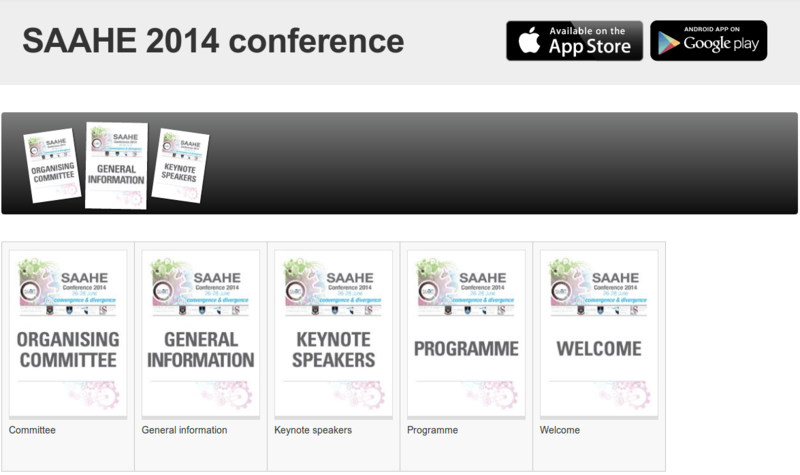 Conference content is available through the browser, as well as through the app. The conference app is brought to you by Snapplify, who have been great in terms of helping us to set up the platform and providing a really high level of service. They will have an exhibit at the conference and will be happy to discuss any mobile publishing ideas you may have.